It is to be noted however that in India, RIL Chairman Mukesh Ambani has topped Forbes magazine's list of the 100 richest Indians for the third year in-a-row, pipping billionaires like L N Mittal and Azim Premji with a net worth of USD 27 billion.As per the Forbes research study, the combined net worth of India's 100 richest people rose to USD 300 billion this year from USD 276 billion last year, driven by the country's booming economy and a rally in the stock market.According to the Forbes India Rich List, there are 69 billionaires this year, compared to 52 last year.Ambani was followed by the steel baron Lakshmi Mittal, who retained his second position in the list with a net worth of USD 26.1 billion. However, the wealth of both of these billionaires is believed to have slipped by 15 per cent from the previous amount.There are more than 300 executives working with Indian companies with an annual salary of more than US$ 447800 per annum (Rs two crore per annum). US is ranked 6th , UK 18th and India 123 rd in ranking in terms of per capita GDP . Interestingly, in terms of perceived corruption index, Uk is ranked 17th, US 18th and India 84th in the list of about 182 countries. 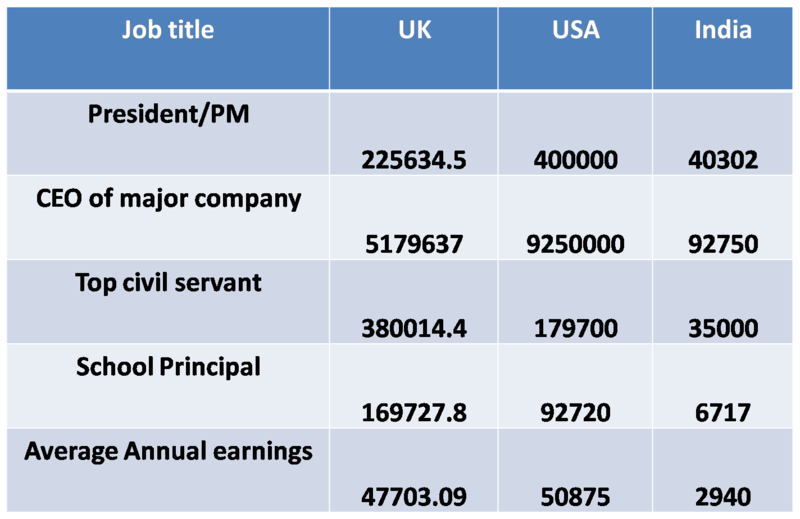 India presents a unique case where the extremes in salaries is huge among the companies and a sample size of top 250 CEOs could be miselading. The average salary as seen above is low. I have always wondered whether extremely low levels of compensation at various levels have encouraged corruption in emerging countries including India. The basic issue remains as to how the salaries are determined. It is ofcourse an interplay of demand and supply in labour market. but there are other theories also such as Principal-agent theory ( it is applicable in private owned companies), Tournament theory which presumes that organizations are like tournaments where number of people are competing to occupy the top position which are few in numbers. 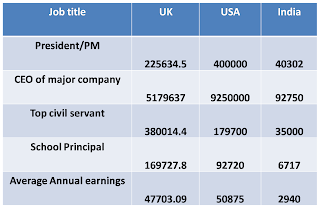 salary at top thus may look disproportionate and an interesting formula to determine salary at top is salary at immediate lower level divided by the probability of getting the next position. For example, if the probability is 50% , the salary doubles, if its 20%, the salary goes up by five times! The other theories are Human capital theory (Gery Becker) and Managerial pay Hypothesis. Inferences, in terms of PPP adjusted diecrepencies and how its a detterent somewhere in achieving higher growth rates can be drawn but then we do have a very young population and the interplay of demand and supply does imply that we remain somewhat above the 'demoralisation cost' point in the pay-effort curve and very few are near the 'crowding out' point on this curve.